clickonstore.net has a fantastic deal for you on Stanley Ergoserv Glass-Lined Airpots. This 2.2 Litre capacity Airpot with glass insulation is now available for just £15 including UK VAT! From clubs to schools, cafeterias to the board-room, the Ergoserv line both looks the part and with it’s substantial construction, is made to last and is backed by a Stanley 5 year warranty. This has to be one of the best prices on Airpots in the UK and the worldwide Stanley brand ensures you are buying the very best quality available. 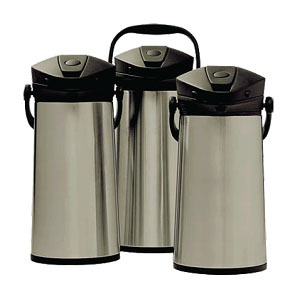 Get your 2.2 Litre Stanley Ergoserv Stainless Airpot from the clickonstore online shop today! This entry was posted in Offers and tagged airpot, ergoserv, glass, insulated, stanley. Bookmark the permalink.